Please share to find an adopter for McCullough # 0336! He is now a 3-STRIKES Wyoming wild horse and just turned 3-years-old. He is at-risk of going to slaughter! You might remember McCullough because we shared him on December 5th, after the previous internet adoption but he didn’t find an adopter that would take him home and now he’s at-risk! Transport & pick up info: Because he’s on the internet adoption he can be picked up at Mantle Ranch, WY; Elm Creek, NE; Pauls Valley, OK; Piney Woods, MS; Mequon, WI. or Archdale, NC (Apr 18) and Springfield, OH (Apr 25). Notes: McCullough now is a 3-Strikes wild horse! #0336 – He just turned 3 yrs old. This nice bay gelding, captured Jan 2013 in the McCullough Peaks Herd Area, WY. This horse is located at the Mantle Ranch in Wyoming right now. The Mantle family contracts with BLM to board and gentle a lot of wild horses. 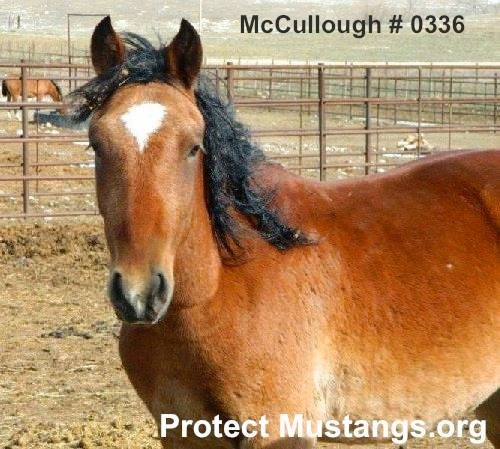 McCullough belongs to BLM until he is safely adopted. The BLM could sell him off if he is not adopted because he is a 3-Strikes wild horse. Together we can help save McCullough! This entry was posted in Uncategorized and tagged Burns Amendment, horse, McCullough, Mustang, Protect mustangs, slaughter, Steve Mantle, wild horses by Protect Mustangs. Bookmark the permalink.